Can the Rock compete without Colin Doyle? If you follow the NLL at all, you’ve probably heard by now that Colin Doyle will be missing the entire 2015 NLL season due to shoulder surgery. Specifically, he hurt his rotator cuff this past summer while playing for the Mann Cup-winning Six Nations Chiefs of MSL. The last time the Rock played an entire season without Doyle, well, it wasn’t pretty. It was 2009 and Doyle was playing his third season in San Jose. The Rock went 6-10 and missed the playoffs. They won no annual awards. They had nobody on either All-Pro team or the All-Rookie team. They had two players in the All-Star Game, Jason Crosbie and Cam Woods, and Woods didn’t even play. They only had 3 people break 60 points and nobody broke 70. Doyle, on the other hand, led the league in points with 111, made the first All-Pro team, and started the All-Star Game. But that was a much different Rock team. There’s a new owner, a new (old) GM, a new coaching staff, and only four players – Rob Marshall, Jeff Gilbert, Cam Woods, and Kasey Beirnes – from that 2009 team are still around. The offensive leaders were Luke Wiles, Lewis Ratcliff (who dropped from 85+ points in 4 straight years to 68), Blaine Manning, Jason Crosbie, Kasey Beirnes, and Craig Conn. Only two of them averaged more than 4 points per game. Compare that to the offensive guys who will need to take over for Doyle this season: Garrett Billings (though he’ll likely miss at least the first month), Stephen Leblanc, Josh Sanderson, Biernes, Rob Hellyer, and Kevin Ross. Last year, only Biernes was under 4 points per game, and Billings was almost 7. So no, we can’t use 2009 as a guide to what’s coming for the Rock this season. It’s not time to panic. The Rock have some pretty talented players up front, and they aren’t going 3-15 this year because they’ve lost Colin Doyle. But while losing one of your offensive leaders is bad, losing Doyle’s leadership and presence in the locker room might be worse. With Doyle gone for the year and Billings out for a while too, what happens now? Is Terry Sanderson making phone calls looking for big-name help? Calgary has tons of firepower, would they be willing to give up a Jeff Shattler? Edmonton managed to get along just fine last year without Corey Small, would they be willing to trade him to the East? 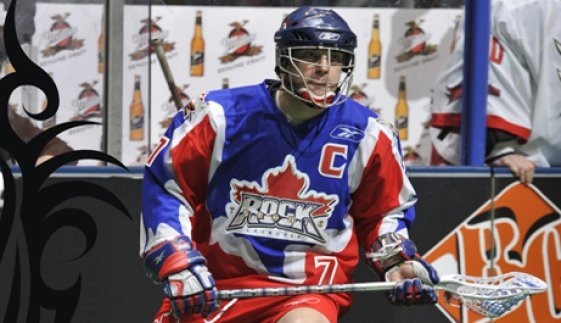 Could T send a couple of draft picks to the Knighthawks for Cody Jamieson? OK, probably not that last one. Of course, you have to give up something significant if you want to bring in a big name. Obviously, we’re not giving up any forwards. I, for one, am much happier with the Rose/Miller combination in goal than I would be with either one as the lone starter, so they both stay. Defense was the Rock’s weak point last year, but they’ve added Brock Sorensen and Jeff Gilbert. This doesn’t turn them into the Edmonton Rush, but along with guys like Bill Greer, Sandy Chapman, and Patrick Merrill, it ain’t half bad. That said, it’s not good enough to trade anyone away. The transition is pretty good – in fact, I might say that guys like guys like Brodie Merrill, Jesse Gamble, Damon Edwards, and Rob Marshall give you one of the best transition teams in the NLL. Would Gamble and a high pick or two get you a strong lefty shooter? Maybe – the Stealth got (lefty) Johnny Powless and Joel McCready for 3 first round picks and a high second. But lefty shooters seem to be in rather high demand throughout the league. And I have no idea what kind of first round draft picks the Rock have in upcoming years. And I really don’t want to give up Jesse Gamble. In 2012, Doyle missed two games, scored a single point in each of the next two, and then missed another one. In 2013, he only missed one game. In those six games, the Rock were 4-2 (including 2 wins against the Knighthawks) so they can play and win without Doyle. But can they pull that off over an entire season? I say yes, provisionally. As long as a few things fall in the Rock’s favour, they can compete. First, Billings has to return at close to his normal level less than 6 weeks into the season. If he misses half the season or more, that would be too much for the Rock to recover from. Secondly, we can’t afford to have anyone drop in production. Guys like Leblanc, Sanderson, and Hellyer need to keep their numbers up where they were last year. Third, Kevin Ross needs to make the most of what will likely be lots more playing time. His best season was 59 points in 16 games for the Swarm in 2012; the Rock need that kind of production out of him. And fourth, there are a bunch of rookie forwards currently listed on the Rock roster – one of them needs to make the team and produce. A Rhys Duch / Mark Matthews kind of rookie season is a bit much to ask for, but a solid 30-35 points would be great. If all four of those things happen, the Rock are in good shape. If they get two or three of them, they’ll be fine. But if none of those things happen, barring a huge trade, we may see the same level of playoff success as that 2009 Rock team.